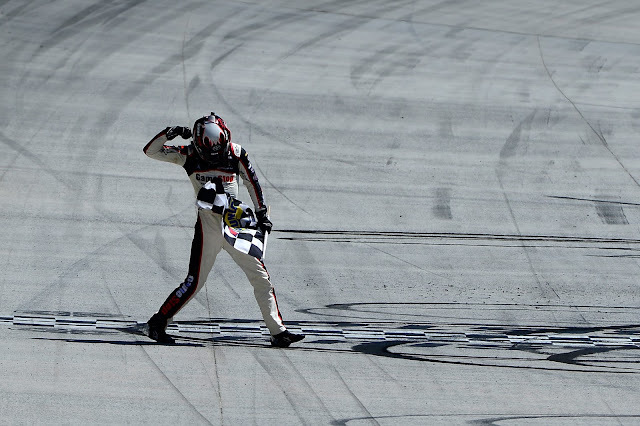 Erik Jones fist pumps in celebration after winning the Xfinity race at Bristol on April 16, 2016. The Bristol race was full of costume changes for driver Matt DiBenedetto, as he wore a rock star get-up, spray streamers and tears of joy -- all in one day. For driver introductions, DiBenedetto sported a long gray-blonde beard and an electric guitar as he rocked the catwalk to “Sharp Dressed Man” by ZZ Top. When he arrived home that night after the race, neighbors were waiting outside to celebrate and sprayed him with Silly String® amidst cheers and whistles. But the best part of his day came in between, when he finished sixth in the Food City 500. DiBenedetto drives the No. 83 for BK Racing, one of the smaller teams in the Sprint Cup garage. To finish just outside the top five for the first time in his Cup career was a huge deal for the 24-year-old driver. “That’s unbelievable for a team like to us to be growing this much and for us to get a sixth-place run,” he said. “I’m sorry I’m so emotional. It’s just this is like a win for us. I am so excited!” he stated as he blinked back tears during his post-race interview on FOX. Race winner Carl Edwards was impressed with DiBenedetto’s finish, too. DiBenedetto’s emotional interview marked the second time tears were shed by a driver at Bristol in as many days. Erik Jones won the Xfinity series race on Saturday, as well as the Dash4Cash bonus of $100,000. The TV broadcast showed him wiping his eyes in Victory Lane as he spoke to his mom and dad on the phone. Though he was thrilled about the win, the tears were bittersweet because of the reason his parents weren’t trackside for the win. DiBenedetto shed tears of joy. Jones cried happy tears mingled with sad ones, as emotions sometimes blend into one another in complicated situations. A grown man unashamedly shedding victory tears is a beautiful thing, because our emotions are a gift from God. Whether you’re a man or woman, grown-up or child, there’s no need to hide your joyful emotions. God designed us to express ourselves, and He knows our feelings can sometimes overwhelm us. Like a NASCAR driver celebrates by doing a burnout, waving the checkered flag and shouting “Wooooooo!” over the radio, we can celebrate our joyful times, too. And one of the best ways to use our God-given emotions is to direct them heavenward -- in praise, prayer and singing. If you believe in Jesus as your Savior, you have reason to celebrate a victory that transcends anything this earthly life has to offer. Go ahead – shout your joy, sing God’s praises and cry happy tears. Wooooooo!